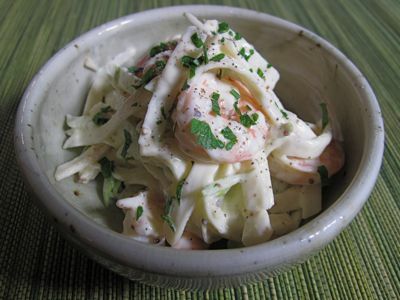 Next, I mixed up a mayonnaise dressing with some lemon juice, mustard with whole grains, salt and pepper and some chopped Italian parsley and tossed this with the shredded celeriac and placed it in the fridge for a couple of hours. Meanwhile, I brined some prawns and briefly boiled them until JUST done. Do not overcook prawns, and don’t store them in the fridge after you cook them unless you want them to toughen up a bit. 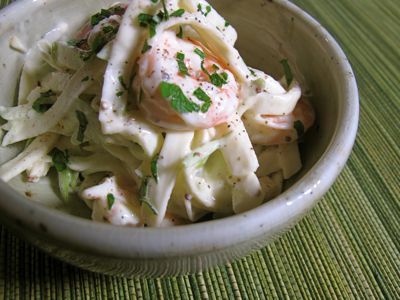 Peeled, I added the cooled prawns to the celeriac salad just before serving. Yum. Refreshing, delicious and a tad less costly than say shrimp cocktail or a crab cake to start the meal… The celeriac has a faint celery like flavor, and it also pairs well with tarter green apples like Granny Smiths in case you want to add those to the dish (I did that once, and it worked very nicely). Hmmm….another one to try on my usual christmas holiday break. Thanks !!! hmm . I’ve never come across a celeriac before here in Dubai, what’s the taste or texture like? That’s a fantastically fresh celeriac you’ve got – still with the green tops! And what a knife! One could only find these fresh celeriacs in the beginning of summer here. I love celeriacs and I’ve used it as a substitute for the stick celery when I didnt have any on hand, to make Waldorf salad. It was yummy combined with granny smiths as well! Your prawn combination is indeed refreshing. Celeriacs are great on soups and give lots of flavour to stews. It’s a real winter treat. 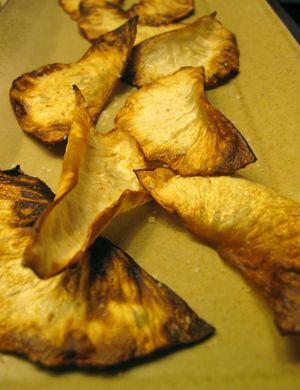 I read somewhere that the crisps do better in the oven. i read it first as CERELAC, the baby cereal, and I have to admit that when I was in high school I enjoyed munching on a handful of dry CERELAC from my baby sister’s supply. I am shameless… but maybe the next time i’m in a grocery i’ll buy myself a box. 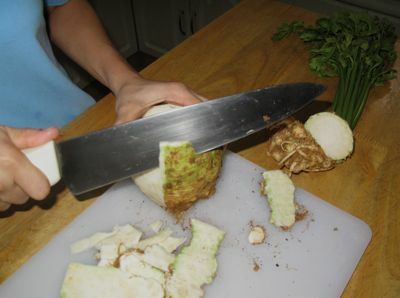 I always save the core & the root of regular celery bunches for myself & just eat those w sea salt. I’ve hesitated to get those huge knobs of celeriac. Next time, I’ll get some & add to winter soups or just nosh on them! Celeriac is very nice mashed in with potatoes, or pureed on its own. I had a celeriac/kale/potato mash a year or so ago that was absolutely delicious. MM –is celeriac the same one as celery root? i do what you do and just put newspapers down when we have crabs, shrimp or lobsters. make clean up a lot easier!!! vicky go– have you tried sauteing celery and chinese sausage together? it is so good!! we make mashed celeriac and it really tastes good…parang mashed potatoes only lighter. i’ll try them raw soon, too. Hi MM, off topic…Your knife, you have done posts on your saucepans, etc…but I don’t believe you have done one on knives… Been wanting to buy one but don’t know what to look for, besides the price….how did you choose yours? MM: Thanks for the recipe. I tried this as part of our Christmas meal. But instead of italian parsley I used dill. It was tasty. I had an impression that the cereliac would be more tender from your picture, instead it had the consistency of carrot but seemingly less crunchy. Maybe I should have cut it thinner than I had. Geurt, Dizon farms grows celeriac. It is sometimes for sale in at the Shoemart or SM Grocery in Makati, usually displayed in the main lobby. Best bet is to check on Friday or Saturday. It’s an unusual offering for Manila, so get a couple when you find it. I have a post on finding celeriac a few days before this post.